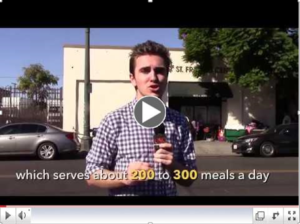 Check out a video from student, Brogan Kroener, from the USC Annenberg School for Communication and Journalism, where he highlights both the issue of homelessness in Los Angeles as well as how St. Francis Center is working to be a a part of the solution. Included are interviews with Jose Ramirez, Executive Director, Martin Karpiel, Board Member, as well as two of our guests. Homelessness is no longer a Skid Row problem, but is becoming more visible and expanding to other Los Angeles communities, such as South LA, the Valley, and Hollywood. In the midst of the ever-growing problem of homelessness, the work of St. Francis Center is more important than ever. This past year, we served a record-breaking 130,000 meals, provided over 18,000 grocery visits, and recovered over 1.3 million pounds of food. We also have a Resource Specialist on-site to provide case management services to provide more comprehensive assistance. Come be a part of the solution and volunteer!